The death of “steady state” offers good lessons in healthy change. No one can argue we are in the midst of massive disruptive change. Amidst global revolution, change expands far beyond technology and the internet. (these being the fuel source.) We are not living an era of subtle or incremental change. This revolution is spawning challenges and debates and examination in EVERY aspect of how we think, live, and work: Societal metamorphosis. Like the invention of modern transportation, everything that follows is forever changed. When one of these revolutions comes along, everything gets pretty intense. All major societal revolutions have followed similar patterns since the dawn of writing 4000 years ago. The primary difference with this period, is that it’s global: Family, political, economic, and social systems are in flux and disarray world-wide. While change is the most natural of life forces, when the systems and structures we have come to rely on outgrow their shell, it creates chaos for a period of time. Tension grows and vulnerability is exposed between the old ways and the new, unrevealed future. The most important truth we have to keep front and center: Change is the normal state of everything that is alive. How do you create a sense of calm and stability in the midst of revolution? Whether change is extreme or small, it is always happening. “Managing change” has grown to a billions-dollar industry to better control and manage process and costs organizationally, in service of technology adoption and modern work practices. Leaders are juggling greater complexity and adapting to workforce expectations and delivering results. And, a sense of stability (what doesn’t change?) is important to our well-being, even as humans are built for change. Great leaders understand that during big changes, managing people’s emotional condition, stirring their hearts, grounding the mission in a higher purpose – are essential qualities to keep people’s attention focused on the future. The most effective change management during extreme evolution, is creating a cultural environment in which change feels natural and encounters the least resistance. This is not about absence of structure. In fact, getting this right requires new structures that prioritize people and their creative spirit and deepest yearnings, over everything else. 1) Eliminate “Change is Done-TO-Me” programs. I’m not suggesting organizational change must be a crowd-sourced permission-based activity. 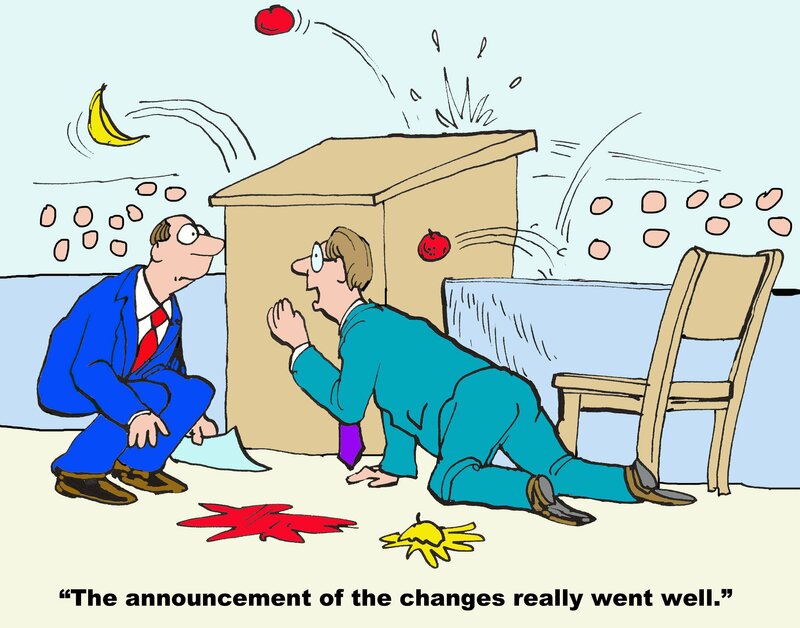 But as leaders, we must understand that designing and undertaking a major “top-down” change (ie, an acquisition or new leadership regime) is not going to work well because you produced convincing, beautiful PowerPoints about the inflection points and workstreams and political nuances. Or, hired a consulting firm to manage your people through change management. Bottom line, top-down change goes against the grain of people’s natural drive. If you want a change to be embraced more quickly and unfold smoothly, spend thoughtful time discussing HOW to counter-balance the “done-to-me” feeling. Strengthen connection to purpose and mission. Double down on communication around purpose and mission, separate from the change. Create meaningful and powerful conversations that connect people to an exciting WHY in your company. Be inclusive. Launch communications and efforts that everyone can enjoy. SHOW you care about improving employee’s AND customer’s lives, even when the environment is intense. Sponsor mindfulness or stress-reduction classes. Up-level your fun-at-work program to ensure people are laughing and enjoying being at work more. When you put attention on building ongoing processes for counter-balancing the serious, intense energy of “Thou Shalt”.. people trust more. This helps create positive feelings towards change that “must” happen – ie, less resistance. 2. Get the psychology right. People embrace change when they see the purpose and benefit, personally. Yet, most organizations are still structured such that the people doing most of the work, gain the least benefit. Until very recently, companies (and all corporations, by design) operated with the mindset that the purpose of business is to foster and reward financial performance. The well-being and personal benefit of the people who made it happen, is a nice-to-have, or not relevant at all. When the mindset of leaders pits financial performance in opposition to creating environments whee employees grow, thrive and love being at work – an “either/or” equation – you are pitting people against people. This does not grease the wheels for what I’ve dubbed the Freedom Era – an entire generation that values choice, freedom, and expanding personally. This is the real opportunity for companies – because your employees AND customers are increasingly part of this generation and value system. Companies whose leaders move past “us versus them” into “how we co-create better opportunities, together” will win competitive advantage – and able to move at the speed of change. In an world rapidly shifting towards an employee-centered economy, leaders are now psychologists. Learning the basics of fostering strong human relationship-building, resiliency, trust, and collaboration are essential. You can see this in the focus within younger generations on “personal benefit” (which is only going to strengthen.) If your change message centers around financial results or “ROI to the company” that has no impact on 90% of your people, you won’t gain people support. Spend time thinking of what ARE the real motivations of your people and how the change you’re making, supports them. Imagine your workforce was comprised of volunteers. How would you convince them to stick around and support a difficult or big change in the business? Even better, ask some of them. Servant leadership is a good description of the mindset, organizational structure, and relationship framework needed in companies today. Sameer Dholakia of SendGrid is a great example of this in action. When changes in business are visibly supporting the good of the person AND the organization, maximum profitable growth occurs. This applies to any company of any size. Worker and customer expectations are colliding with the ability of every organization in every industry to meet complex demands and constant change. Extinction is an imminent and real threat, no matter who you are. Shorter, more focused meetings. Most meetings waste far too much of people’s time. Obtain our Better Meetings Guidebook here. Be transparent and real. The social media world we live in, seems to shine the light on the dark side. As a leader, BE THE LIGHT. If there’s going to be a downside, SAY it. You lower people’s stress when you communicate, frequently and decisively, about hard news. Leaving the rumor mill to determine what people hear and feel, will ensure it’s not the story you want circulating. Remind people of what DOESN’T change: Our Core Values. Our attention to amazing customer service. Caring about one another. Whatever it is that will NOT change, be sure you shine the spotlight on stability, as much as the changing landscape. Change is normal and natural. Extended periods of human stress in response to change, is NOT normal or natural. As a leader, your primary job these days, is shifting attention off the past and loss, to present goodness and future possibility. My Change Game – a ground-breaking, interactive board game that can be played in off-site retreats, Leadership Universities, or to Kick-Off a change event. Our virtual Modern Culture Academy is a valuable resource. Affordable, convenient culture training for you and your team. Classes begin September 8. Live facilitation by Lisa Jackson, with recorded sessions and interactive dialogue.